The Signals Art Pavilion was developed as an innovative approach to disseminating contemporary video art throughout the streets of Calgary, Canada. The work was awarded first prize in an international competition, and was commissioned for Calgary’s annual ArtCITY arts festival soon thereafter. Signals is installed at the very core of the city. The pavilion consists of a monitor and a DVD player that are housed within a modified pedestrian crosswalk signal. Pivoting arms enable the pavilion to be adjusted for optimal viewing and a remote control provides the curator with a means to operate the system. Here, art is the signal. The project was conceived as a work that would belong to the citizens and would mark their enthusiasm for the arts by becoming an integral part of the very infrastructure that supports life and movement in the city. It is accessible to all. Its electricity is paid for by all. And it represents a civic commitment to the arts that is reaffirmed every year, during the ArtCITY festival. 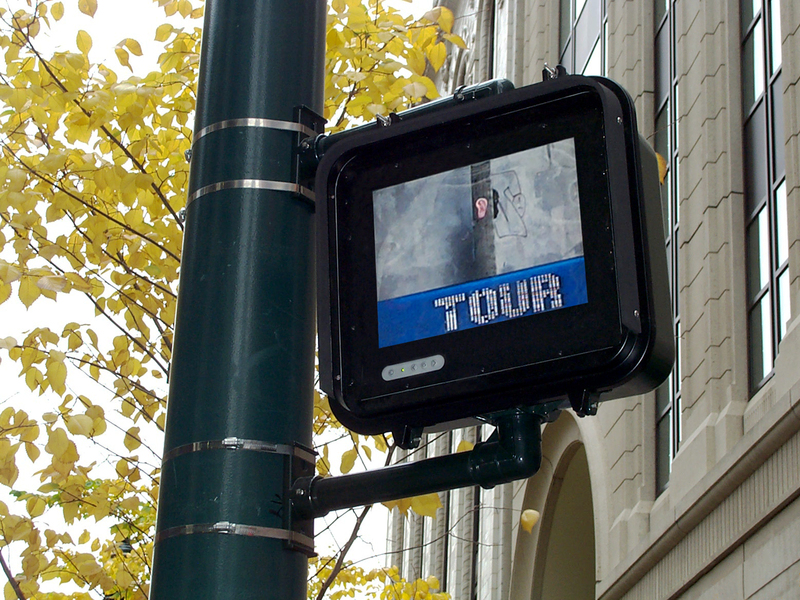 As the Signals system is modular, it can easily scale up by adding more units to the network at a variety of locations, propagating art throughout downtown and beyond, all day and all night.